Yogi Berra may not have gotten the majority of the headlines during his amazing career with the New York Yankees, yet he is often credited with being the backbone of the team. Like his career, Berra doesn't hold the top places for most valuable baseball cards, but in each of his early Bowman and Topps appearances, his cards maintain a solid amount of value that makes the entire set stronger. This list of the top Yogi Berra cards delves through those early appearances, as well as his extended playing and managing career, to find ten of the best cards. Shop for Professionally Graded Yogi Berra Cards on eBay. An 18-time All-Star and ten-time World Series champion as a player, Yogi Berra held just about every World Series and catcher offensive record at his retirement. Berra was also an amazing defensive catcher and he was one of only four players to ever have a perfect errorless-season at the position. Given his lengthy and successful career, a list of ten cards barely scratches the surface of Berra's baseball card history. Although several notable cards were not included on the list, they are certainly worth tracking down for your collection. The earliest card featured on this list dates from 1948, however, Berra has a few rare appearances that pre-date his rookie and can command large sums. Take a look at the 1947 Homogenized Bond Bread set or 1947 Tip Top Bread set for some of his pre-rookie card appearances. Another option is 1952 Red Man Tobacco, where you can find a card featuring a beautiful painting of Berra in his catching gear. One of the most iconic baseball images features Yogi Berra jumping into the arms of pitcher Don Larsen after he threw a perfect game during the 1956 World Series. 2007 Upper Deck Masterpieces includes a painted version of that moment (card #7) and also several framed parallels. 1965 Topps offers Berra's first non-Yankees cards from his time as the player-manager for the rival New York Mets. Just as he was in the right place at the right time to have such amazing teammates during his career with the Yankees, Yogi Berra's early cardboard appearances are found in the most collectible and sought-after sets ever printed. This top list balances the incredible value of Yogi Berra cards with the desire to include some cards that any collector can afford and be proud to include in their collection. 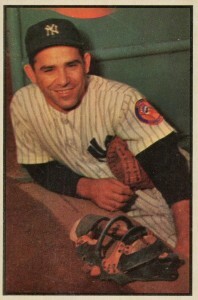 Obviously there are plenty more Yogi Berra cards that are popular with collectors. Let us know your favorites in the comments. 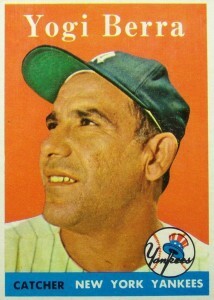 Let's begin Yogi Berra's top ten list with the iconic image from his 1958 Topps card. A new inclusion in the 1958 set were cards devoted to All-Star game selections and they were added in as the last 20 cards in the set's checklist. 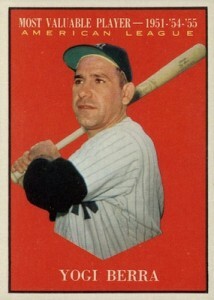 Even though Berra was an All-Star in 1958 (and 17 other times), he wasn't included in that sequence of cards and only makes one appearance in the set. In one of the later series of the 1961 Topps set, a small group of cards featuring the recent winners of the Most Valuable Player award are available. 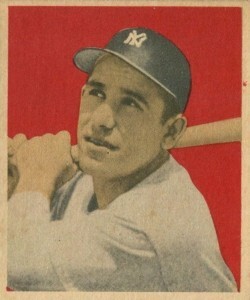 Berra's card highlights his MVP wins in 1951, 1954, and 1955. However, the card's reverse side lists his awards as "51-54, 55" making it look like he won five awards instead of three. The error was almost possible, though, as Berra finished second in MVP voting twice, losing to his teammate Mickey Mante and Al Rosen of the Cleveland Indians. 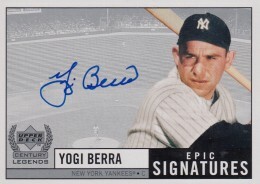 Yogi Berra was a frequent baseball card signer and when selecting a certified autograph to add to your collection, there are quite a few options to check out. Given the hobby preference for on-card autographs, the Epic Signature insert set in 1999 Upper Deck Century Legends offers a great design with a large autograph area that allows Berra get his large "Y" on the card comfortably. Because there are many autographs available for Yogi Berra, it is not uncommon to find copies for roughly the same price as some of his key cards from his playing days. While there aren't many Yogi Berra cards from his active career that feature him in his catching gear, 1953 Bowman Color is about as close as you'll come to that among his Bowman and Topps appearances. Here he sits on the dugout steps with catcher's glove in hand and his mask ready to go. The card's value is only surpassed in the set by his teammate Mickey Mantle and the remarkable action shot of Pee Wee Reese. 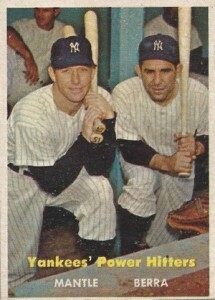 Berra's two cards in the 1957 Topps were on opposite ends of the checklist. He started at card #2 and ended with Mickey Mantle as the last card in the set (#407). These vertical combo cards were new for the 1957 set and would become more and more popular in future sets. These two "Yankees' Power Hitters" are still just as powerful on the auction block where highly-graded versions of this card can reach over $1,000. 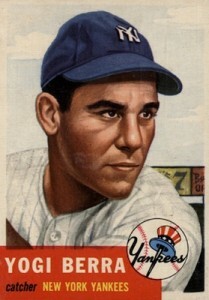 Although many of Yogi Berra's cards feature his trademark smile that seems to fit his easy-going personality, his 1953 Topps card shows him with a stern stare, hinting at the fiery side more evident during his play. This was certainly on display when Berra nearly attacked the umpire after Jackie Robinson famously slid under his tag and stole home during the 1955 World Series. Even though Berra has a card in the small 1951 Topps Red Backs set, it is his 1952 Topps card that is the most sought-after of all his Topps appearances. Cards rated "very good" can still command prices of several hundred dollars with those very few "near-mint" copies reaching as high as $1,500. 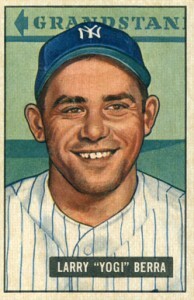 The iconic Berra smile is on display on his 1951 Bowman card that also notes that the grandstand is to the left. 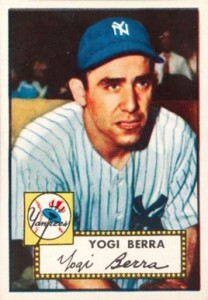 This is one of the last cards to feature his full name of "Larry Berra" as future releases would name him "Yogi" exclusively. Yogi Berra received the nickname from a childhood friend who thought he looked like a wise yogi from India. 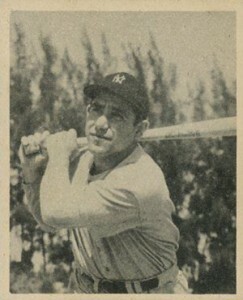 Although at first glance you might suspect the same photograph was used in the 1948 and 1949 Bowman sets, Yogi Berra's 1949 card is slightly different. The bright red background also loudly exclaims the inclusion of color for the first time in a Bowman set. Because his card came in the the first half of the set, it did not feature a nameplate on the front. Those were added after card #109 in the set. Of the 48 cards that make up the 1948 Bowman set, only Stan Musial's rookie card tops Yogi Berra in terms of value. That seems serendipitous because when Berra was a prospect, he wanted to play for his hometown team, the St. Louis Cardinals. The Cardinals decided instead to sign Joe Garagiola, who was Berra's childhood friend and also a catching prospect. Expect to pay several hundred dollars for copies of this card even at the lower-graded levels. 1998 Topps #44 Yogi Berra Autograph Signature NM Near Mint Hall of Fame Collect.